When I was organizing my photos this weekend, I came across a fair number that I’ve never used in blog posts. Not sure why; maybe it’s that my (relatively new) blog-related compulsion to photograph virtually every dish I cook, bake, or eat has produced a backlog. It also struck me that I’ve always depended on the kindness of strangers to provide inspiration, unique recipes, or novel combinations of ingredients that often direct me in my cooking and baking exploits. And what better way to acknowledge their inspiration than to showcase some of these photos–and their recipes–here? These chocolate-cranberry biscotti, adapted from a recipe in Patricia Greenberg’s Whole Soy Cookbook, were my first attempt at these crisp coffee-dunkers. I wish I’d read Romina’s post about her own version before I made these, as I definitely baked them too long. While visually appealing, they were probably more useful as paperweights or doorstops than cookies. After a long soak in a hot tub cup of tea or coffee, though, they were just fine. Next up were Vegan Magic Cookie Bars from Susan’s blog. When I was a kid, we called these “Hello Dollies” in our house (Why “Dolly?” No idea.). Susan warns that these are definitely not fat-free. Having said that, they were gooey, rich, and deliciously decadent. I had to give the rest away or I would have consumed them all. 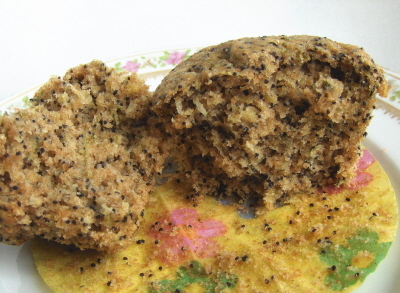 These speckled darlings are Lemon-Zucchini Poppyseed Muffins adapted from one of my favorite cookbooks, Laura Matthias’s Extraveganza. With a tender, ethereal lightness, these muffins seemed almost too fragile for this world. Didn’t stop us from eating them, of course. 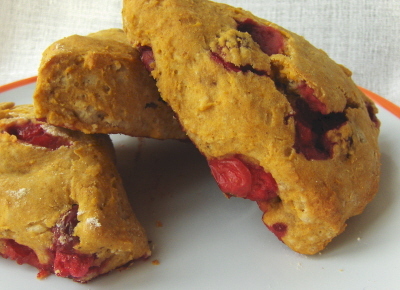 These gorgeous, golden beauties are Sweet Potato and Cranberry Scones, a test recipe for Anne-Kristin at Swell Vegan. I adored these–juicy with tart cranberries, a base that’s satisfying, lightly spiced and not too sweet, with the expected heft you’d get from a conventional biscuit. The HH and I thoroughly enjoyed these for breakfast (oh, and a few snacks). Another recipe courtesy of a fellow blogger: this Raw Carrot Cake and Cashew Cheeze Frosting hails from Lindsay over at Day to Day Vegan. I’d been wanting to try this cake ever since Valentine’s Day, when we both participated in the Vegetable Love contest! My version came out a bit softer than Lindsay’s, so I just popped it in the freezer for about 20 minutes before unmolding and frosting. Raw, with a mysterious magnetism. . . This was yummy! (Well, you just knew that’s where I was going with this one, didn’t you?). Thanks to all my baking muses! Now, back to reading more blogs for new ideas. . . I think I might go into sugar shock!! Look at all these yummy sweets! Mmm… I love hello dollies! I’ve had that recipe on my “to do” list for so so long! Wow, you have been baking up some delicious desserts. Amazing assortment of yumminess! The raw carrot cake and the scones really have my attention! so glad that you found/posted these photographs!! the biscotti, magic cookie bars, scones, muffins, AND brownies look sensational!! Fantastic! Makes me want to go make some carob brownies right now! I liked your meme from yesterday, too. Reminded me that I have to review a book I didn’t particularly like. Ugh. Oh my goodness – I just made it over here and was greeted with a collection of the most mouth-watering photos I’ve ever seen! I’m adding those brownies and lemony muffins to my ‘to-bake’ list right away! Oh seriously… you are killing me! Everything looks sooooo good. I usually go with my instincts with recipes, too, but in this case, I’d never made biscotti before, so I assumed the recipe would steer me in the right direction! Next time, I’ll follow your advice! I hadn’t realized how much baking there had been until I saw all the photos. . . I’m waiting for the Swell Vegan to publish her e-zine so I can have the “official” scone recipe! The brownies really are tremendous. If you don’t already have the cookbook, I’d definitely recommend buying it (though I should warn you, she uses barley flour in virtually everything!). Okay, so it was cheesy (“chocolatey”? ), but how could I NOT include that reference? (And besides, anything chocolate works for me. . .). Sorry about the book review (no fun). But carob brownies sound terrific–I’d be curious to see how the Simple Treats recipe came out with a carob version. Thanks so much for visiting, and for your comment! I hopped on over to your blog and was enchanted by your stories and photos. Will visit again! just checked the link to sweet treats and it went to the raw carrot cake rather than the book – now I want to make the carrot cake too! For being a baking backlog, those are some really nice pictures. The brownies in particular look amazing. Oh my goodness, look at all those amazing baked goods! !